The Honeywell Dolphin 6110 mobile computer has the tools you need to speed up data management in any applications within-the-four-walls. An ergonomic design and aggressive scanning options put the Dolphin 6110 at home in warehouses, stockrooms, or any retail to light industrial environment. 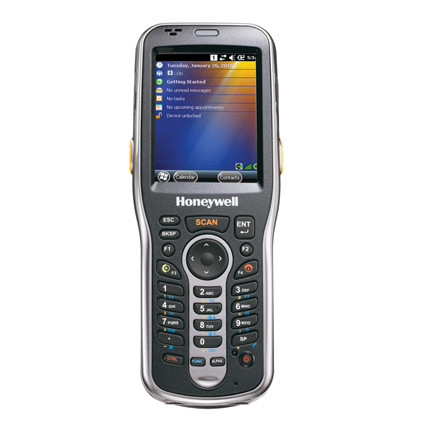 Honeywell´s Dolphin 6110 features your choice of laser scanner or 2D area imager. Each scanner is installed at an angle from the top of the Dolphin 6110, allowing you to scan barcodes while still seeing the screen. The mobile computer also sports a 28-key keypad, great for manual data entry such as item quantities or extended descriptions. The Dolphin 6110 comes with a variety of radios designed to keep you in contact with the resources you need. The 802.11a/b/g/n WiFi allows for real-time updates to inventory, ideal for high stakes shipping and picking applications. For secondary peripherals, such as picklist headsets, mobile printers, or additional barcode scanners, the Bluetooth radio keeps all your gear connected. Durability is key for any device, and the Dolphin 6110 meets the needs of most demanding applications. The lightweight mobile computer is rated to survive drops of four feet to concrete, such as a drop off a counter or the back of a truck. It´s gasket seal provides an IP54 rating, keeping dust and water splashes from harming internal components. With a 1 year warranty standard and additional coverage plans available, the Dolphin 6110 is a smart choice for the discerning employer. The Dolphin 6110 does not ship with communications cables. We recommend 6100-COMM- KIT. Standard Battery: 2.7" x 1.5" x 6.9"
Extended Battery: 2.7" x 1.7" x 6.9"